Now say that three times – real fast! But seriously, though, there is much to be said for giving some creative time to selecting the props that you use in your product photography. I am fortunate in that I don’t typically need props for my products, other than engaging my pets as models. But what do you do if you really need to “stage” your products to show them at their best? My first suggestion is to just take a look around you. You know your product, so look both online and in brick and mortar stores to see how your product type is displayed, and decide which models would serve you best. Magazines are also a great source of inspiration. For example, do you sell jewelry or clothing? Would a mannequin like the one above work well for an overall jewelry display? For individual jewelry pieces, would a beautiful slab of stone, or a piece of tile or wood work as a backdrop for your products? Look at products sold on Etsy. Which photos catch your eye and make you want to purchase? Taking great photos for online selling is essential, but before the product shots you need to gather the props. 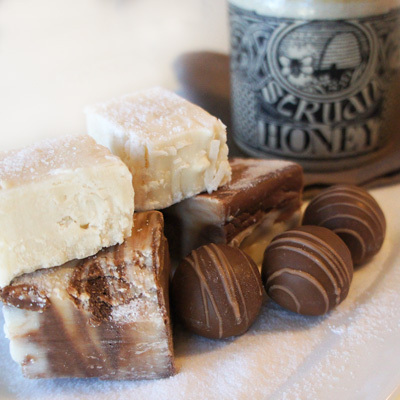 My daughter recently asked me to assist with some photography of her food (sweets) that she wants to sell online. The first thing I did was search for some great props. What a fun assignment! 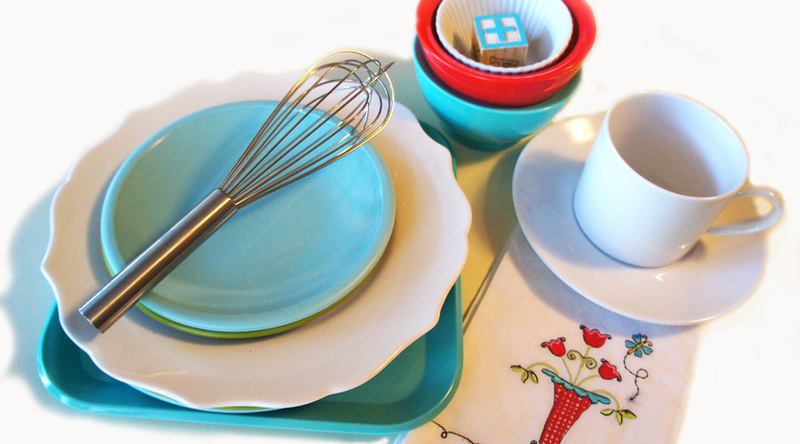 I found plates, cups, silverware, and a couple of pretty little dish towels that work beautifully to help show off the fudge and other sweets she wants to sell. I even used a very small vase and some rosemary twigs from the garden for some of the photo shoots. For one set of photos I used some little vintage children’s blocks with lettering. Search your home and what you already have on hand, or borrow items from family or friends to use as props. The photo above has a Celtic design honey jar from Scotland that I have owned for many years. You can find amazing things at antique shops as photo props; the little bit of nostalgia they provide for photos makes them quite charming! It’s Etsy Friday again and I’m here this week to bring you some of my favorite items! Enjoy Shopping! 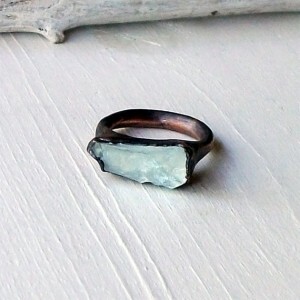 This lovely aquamarine and copper ring with it’s crystalline beauty is made by Midwest Alchemy. 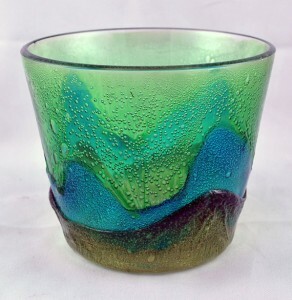 The shard of aquamarine is surrounded in a electroformed copper band and has been treated with LOS, sealed with Renaissance Wax and has a matte finish. Each unique piece of jewelry by Kelly at Midwest Alchemy is completely handmade in her studio in northern Ohio. Stones are chosen for their color, texture, shape and feel. I just love the mix of the more rustic sculptural copper element along with the natural beauty of the rough gemstones. Rings and pendants are also available with stones of crystal, amethyst, quarts, topaz, opal, tourmaline, garnet, sapphire, citrine, druzy, labradorite, turquoise, chrysoprase, pyrite, and pearl. Truly something for everyone! Midwest Alchemy is also an Etsy Featured Shop. I simply adore vintage inspired designs, and Ella from Ella Gajewska Hatsin Poland makes some of the finest millinery you’ve ever seen! This particular piece is a fashioned after straw hats from the 1920’s with a small brim and asymmetric crown. 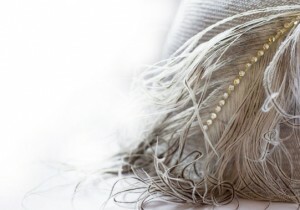 It is beautifully detailed with hand applied Swarovski crystals on a soft natural ostrich feather.This elegant hat has been hand blocked and is an original design. The shop owner can create something beautiful and customized just for you, depending on your interests. She has a lovely Etsy shop full of all types of hats – everything from her “Teddy Bear Winter Hat” (you have to see that one! ), to knit caps, fedoras, and romantic turn-of-the-century designs. 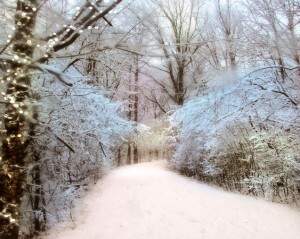 So stunningly beautiful! There is just something about old keys and vintage architectural pieces that I find fascinating. I think it’s because when I touch these little pieces of history I always stop to reflect on who might have created them, owned them, or used them in times long ago. 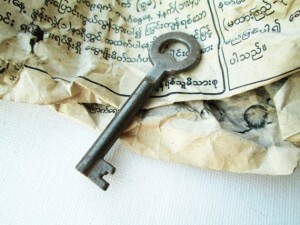 Such is the case with these pretty little metal skeleton keys sold by Etsy seller ChokkoVintage. These little keys are beautiful as home decor, in crafting projects, or…I can picture one on a chain that rests on the bodice of my vintage dress form! Chokko Vintage has many to choose from; all keys ship from Thailand. After the organized get together with fellow Etsy sellers in Austin, Texas last Saturday, I am delighted to introduce several of them via this week’s Etsy finds! So many great local artists! 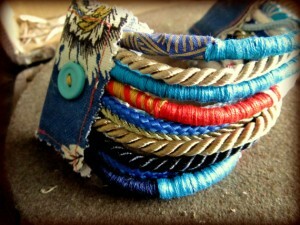 Rachel Anderson of One Man’s Trash makes these really cute fiber bracelets from braided satin, scrap cords, and wrapped cotton fibers. Add some vintage style floral twill end trim, a stretch loop and buttons, and they fit perfectly around the wrist. They are all unique and really colorful! According to Rachel, they are, “A little bit 80’s…a little bit hipster..and just weird enough to make your jeans and ratty t-shirt cool enough for happy hour.” Gotta love that, and the fact that these beauties are recycled and re-purposed! 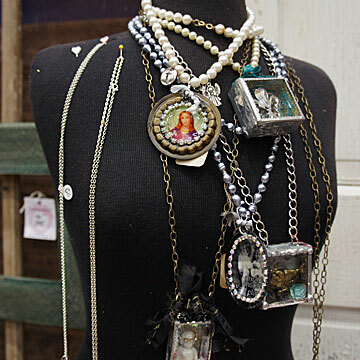 Rachel also has some lovely necklaces, earrings, and rings in her shop, all made with salvaged materials. I think she must get pretty excited when she comes across a little box of vintage fabric and notion treasures that nobody else knows what to do with. Love, love, love the cute baby and children’s clothing pieces from seller Baby Bolt (Striking Kidswear). Austin is certainly known as the “Live Music Capital of the World”, and there’s no reason not to introduce the kiddos at an early age to electric guitars! 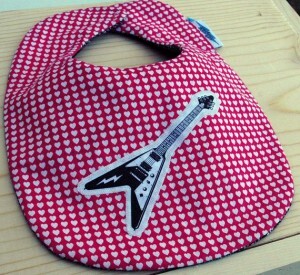 The custom guitar design is zigzag stitched onto this classic size bib (for babies 6-24 months). The reverse is a soft flannel in black and white line checks. This bib has been lined with an extra layer of flannel for extra drool absorbency, which gives it a nice weight and feel. Just place around baby’s neck and attach with the super soft velcro that won’t scratch sensitive infant skin. All fabric used by Baby Bolt is washed in eco friendly dye and fragrance free detergent prior to sewing to ensure minimal shrinkage, and finished clothing can be machine washed and dried. All clothing designs have been tested on babies and children both at home and on the playground prior to listing in the shop. Your kids will love them, and so will you! 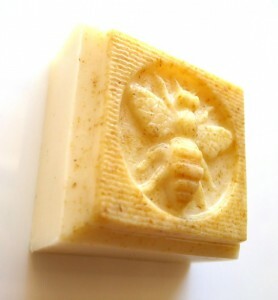 These bars of oatmeal, milk, and honey soap by Feto Soap are so pretty with their “bee” design. A soap favored by both men and women, it is scented with a delicious blend of honey, almond, and vanilla. Yum! The honey in this soap comes from local Texas wildflowers, and no colorants have been added. It’s great for dry and sensitive skin. 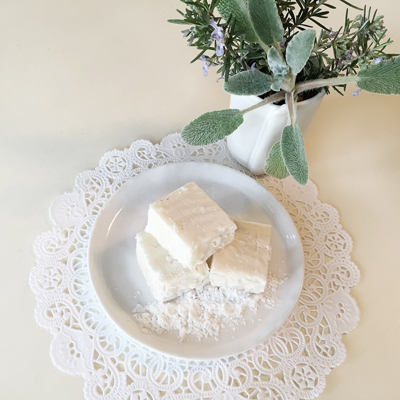 This hypo-allergenic and coconut oil based soap weighs 1.7 ounces and measures: 2 x 2 x 1″. It is packaged in a white organza drawstring bag. All Feto Soap items are handmade locally in small batches in Austin, TX. Soap is made from scratch with both cold and hot process methods. The shop carries glycerin soap, perfumes, lip balms, lotion bars and NEW shea butter sugar scrubs! Products are carried in retail outlets around the country, and are sold in many Austin boutique stores. Feto Soap products are offered as private label, guest bars, bridal shower favors, wedding favors, and baby shower favors. 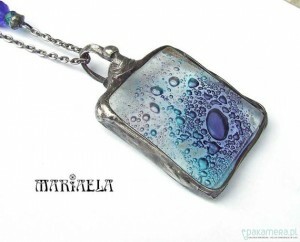 You can also have them shipped as a gift directly to your recipient! Feto soaps have been featured on Home and Garden Television’s Show, That’s Clever, BUST, Woman’s Day Magazine, and The Chicago Tribune. 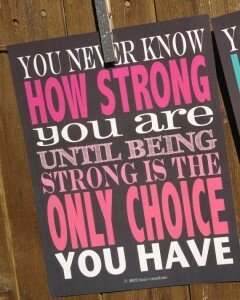 This great poster measures 8×10 inches and is professionally printed on high quality paper. Each poster comes individually packaged in a clear protective cover and includes backing board for shipping stability. All proceeds from this particular item in the Tisa’s Creations shop will be donated to the Breast Cancer Resource Centers of Texas. Tisa’s shop carries simple, modern paper items including cards and stationary. You can also check out her website at: www.tisasspot.blogspot.com.